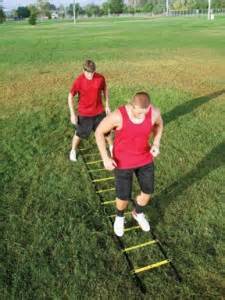 There are times when I discuss incorporating speed ladder type drills, into an overall speed training program, I receive looks of confusion or the “roll your eyes” syndrome. Many people just think speed is a God given talent, which it is, but they don’t stop to think training and developing certain muscles and techniques can help develop natural talent. Can you turn a 7.7 40 yard dash player into a 4.7 sprinter? No of course not, but you can train him into a 7.3 or 7.4 runner, which in a sport which measures winning and losing in thousandths of a second, is a huge improvement. Quick Feet are not discussed as much in baseball as in other sports and I really don’t understand why not, because Everything starts with the Feet. Fielding, Pitching, Hitting, Base Stealing, Throwing are all based on balance and balance comes from keeping your weight over your feet, the balls of your feet that is, you never want to be caught flat footed or back on your heels. Slow feet will limit every aspect of your game, it’s just that simple. 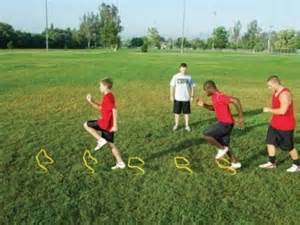 That’s the reason tennis, football, soccer, handball, racquet ball players along with numerous other types of athletes train to increase their foot quickness. The Key word here is Foot Quickness and should not be confused with training to be Fleet of Foot, as we’re not training to run the 440 relay, we’re concerned about developing explosive speed for 5 to 6 feet. I’m going to teach you drills which will help your athletes acquire that instantaneously generated explosive start which is so paramount to getting a “Good Jump” on the ball. * Always push off the balls of your feet, never your toes or flat footed. This maximizes thrust. * Keep your head as still as possible, chin up, which helps stabilize balance. * Pump your hands & arms in sync with your legs as this creates additional power. * Begin All of These Drills Slowly and Work Your Speed Upwards, as it’s more beneficial to perform 5 technically correct drills, than 25 wrong. (1.) Begin with both feet on the ground, at the base of the ladder, shoulder width apart. (2.) Jump up and land inside the first square with your left foot only, immediately push off your left foot to the next square, landing on both feet. (3.) Jump into the next square landing on your right foot only, immediately push off your right foot to the next square landing on both feet. (4.) Left Foot - Both Feet - Right Foot - Both Feet. Continue this rotation until the entire ladder has been crossed, then return using the same foot movements. As your speed increases the benefit of the exercise will increase. (1.) For this drill begin at the Left Side of the ladder, feet shoulder width apart. (2.) Step your right foot into the first square, quickly followed by the left foot. (3.) As quickly as possible step your right foot out of the Right Side of the square, followed by your left. (4.) Step Diagonally left, with your Left Foot, into the second square, followed by your right. (5.) Right foot, followed by Left foot, into first square. Right foot steps outside square, followed by left foot, proceed diagonally repeating the steps back and forth. As you can now see the drills are quite possibly confusing when first learning them, which is why you begin slowly, perfecting form, then increase speed as you memorize the steps. A small cone is required to be utilized for the next few drills, however a substitute of comparable size is alright to use, as long as it serves the purpose. Facing the cone, step the right foot over the cone, followed by the left foot, then repeat the steps going backwards. Perform this back and forth movement stepping motion as quickly as possible for 15 - 30 seconds. Starting with the cone on your right side, you looking forward, step your right foot sideways over the cone, followed by your left foot, reverse the steps back across the cone. Perform this sideways foot movement as quickly as possible for 15 - 30 seconds. Starting with the cone on your right side, remain looking forward, step diagonally forward with your right foot, followed by your left. Step backwards diagonally, left foot followed by right. Repeat. As the name indicates you run in a stationary position, not moving forward or backwards. 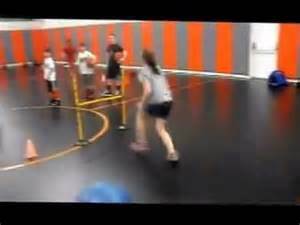 The intent of this drill is to teach launching from the balls of your feet and limiting the time your foot touches the ground before bouncing back up. It’s important to vigorously pump your arms up and down in sync with your legs as you perform this drill as this increases foot speed and enhances overall speed by learning to incorporate your arms into the running process, which increases your overall speed. Place low hurdles along the ground @ 18” apart, or use a ladder, run through or over these hurdles a quickly as possible, touching one foot, then the other as you cross or step in each individual obstacle. Place a piece of tape on a flat surface, gym floor, sidewalk, etc. Standing facing the line, feet 6” - 8” apart, begin jumping back and forth over the line as quickly as possible. The idea is to land simultaneously on both balls of the feet and quickly launch off again. Using the same tape line, start by standing on one side, feet @ 6” - 8” apart. Begin jumping back and forth sideways across the line, keeping your feet in sync and close together. 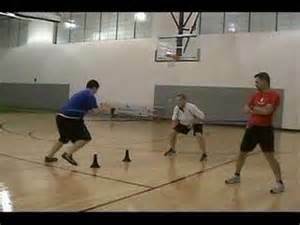 Another excellent drill to increase foot speed, is what’s known as the ring drill. Lay the plastic rings in any variation you require to address the particular need. Again, launching from the balls of your feet, high step through the rings as quickly as possible. The beauty of the rings is they can be immediately reconfigured to change the drill. If you stand directly behind some people as they run, you may not notice it, but a trained coach will quickly see their feet are not hitting the ground directly underneath their hips. So what? This lack of proper technique allows your feet to wander, losing speed and is created by not properly lifting your knees up and down as you run. When I think of the feet wandering, I envision the runner running in circles or zig zag, but that’s not the professionals mean. Should the feet wander a ¼” and back each stride, over a 100 yard dash, you could increase that distance by 2’, which forces the runner to nearly run 101 yards. A quick fix for correcting this bad habit is to align two rows of cones about a 12”-18” apart creating a narrow corridor for the player to run back and forth through, which forces the player’s knees to left straight up and down, keeping your feet under you and straight, increasing quickness. Increasing speed as you develop a routine performing these drills is of course extremely important, but don’t neglect form, as form, such as the pumping of the arms, are all elements of developing Quick Feet.